I guess this is not as clear of a picture as I hoped, but you can still make out the beauty of these bracelets! A very sweet friend of mine from high school made these for me. I emailed her a while back and asked if she would make part of the gifts for me that we will be taking to China. When we asked our agency how many gifts we needed to take, they told us 10-12 gifts. These gifts will be given to each of Mariah's nannies, our guide, and our agency's in-country facilitator. One of the requests I had for these bracelets was for each to have a ladybug somewhere on the bracelet. If you look closely you will see the silver ladybug on each bracelet. That is pretty significant in the China adoption world and I was thrilled to see it! Here are three more of the bracelets. I did ask for twelve bracelets as I intend to keep one for myself and one for Mariah. The hard part is choosing which two I plan to keep. I have a couple of more weeks before I have to decide. These beautiful bracelets were made by Marie Hilty. She was a friend of mine in high school. She makes jewelry of all kind and has a business. Thank you, Marie, for quickly making these bracelets and making them unique! I also thought I'd take a minute and share a little about China and Mariah's provincial city. She is currently residing in Changzhou (pronounced...Chung Joe). As many of you already know, she lives in the orphanage in that city. I cannot wait to take pictures and show you her hometown and her orphanage. The orphanage moved to a brand new location a few years ago and honestly, it is gorgeous! I've seen pictures and other parents have told me how nice the orphanage is now. I believe there are around 300 children living there. She lives with 29 other children ages 0-2yrs. Her orphanage participates with Half the Sky. This wonderful organization comes in to the orphanage and provides much needed care to these children. They provide physical and occupational therapy and consistent nannies to help facilitate healthy attachments for the children living there. Changzhou City, Mariah's city, is located about halfway between Shanghai and Nanjing (provincial capital). It is a city that is most known for it's comb factory. Yes, hair combs! We are hoping to take a tour of the comb factory there. We will also purchase a set of combs as a keepsake for Mariah. Changzhou is also home to the famous China Dinosaur Park. This park is home to over 50 dinosaur fossils from all over China. It also happens to be an amusement park! As well as the dinosaur park, Changzhou also boasts one of the tallest Buddist pagodas named Tianning Temple. Yesterday was just a day of fun here at the Kaminski house. Well, fun for the kids. Jeremy and I worked on getting the pool ready for use while the kids had the garden hose in the front yard. So we snapped a few pictures of the kids playing. High temps were in the 90's! Very warm and humid. Then I cannot forget our youngest little guy. The only picture of him playing with the water was not very good. So I'll choose a picture from a few days before. This is typical of what you would see Ben doing on any given day. He is so much fun! We have decided to stay home this Memorial Day. It is too hard to try to made it back to PA since Jeremy works on Sunday and on Tuesday. That leaves us with less than 24 hours to be with family. A good part of that time would be spent sleeping. It's a little tough to visit with both families and make it back home in time to get everyone to bed at a decent time. We will certainly miss the family reunion with Jeremy's family. I don't remember the last time we were able to be there. Jeremy's schedule is the same every year. We wish it could be different but going home is just not going to work this year since we will be using much of Jeremy's vacation time when we leave for China in just a couple of weeks. To answer any the question you are probably thinking, we did not receive our date for travel yet. We hope to get that by the end of next week. Then we should know when to book our flights. For the next couple of weeks we will continue to prepare. I realized the other day that our toy room is unacceptable. We have Legos EVERYWHERE! My feet have found many of them as I walk through. Ouch!!! These definitely have to be taken care of before Mariah comes home. We received a gift from a sweet couple at church today. The husband picked out a dress for Mariah and the wife chose a beautiful white sweater! This keeps getting more exciting! Wrapping Up and Getting Ready! This past Wednesday night we watched our kids (and Jeremy) receive their awards from our church's AWANA program. I never tire of watching my kids gleam as they receive their awards. To the left here is Kyle receiving his award for his first year of serving in AWANA. Kyle has been faithful to serve with Jeremy (the taller guy in grey)in Gametime. Jeremy is the Director and Kyle was one of his helpers. We are trying to instill in our children how important it is to serve. It seems as though Kyle really enjoys serving others. He has such a great heart! I believe this was Jeremy's 12th year as well. He has the unique opportunity to have contact with all of the children in our AWANA organization (approximately 60 kids). I love to watch Jeremy with these kids. They seem to be drawn to him. I never see Jeremy walk past one of these kids where they don't come over to him and either wrap their arms around his legs or start a tickle fight! Okay, maybe that is not entirely true. I have often times caught Jeremy starting these tickle fights. It is really endearing. I love that my kids get to witness this as well. Can you see why he is such a great Daddy? Here is our sweet Mikey receiving his award. This child has truly overcome HUGE obstacles! If you only knew him as a baby. Oh my! He didn't speak until he was almost three. He has Auditory Processing Disorder and Sensory Integration Dysfunction. Basically, he has a lot of trouble processing information received. All information is overload for him. This has proven to be a huge struggle for him in a traditional classroom setting. So, our classroom at home can be on the couch, on my bed while I'm fixing my hair, standing at the kitchen counter, at the basketball hoop, on the deck, occasionally at his desk......you get the idea. He has thrived as a home schooler! When it came to AWANA and completing his books, I honestly dreaded the thought. By the time we finish school for the day, he is mentally fatigued. He has concentrated so hard throughout the day that there isn't much left. But he is a determined child!! I only helped him a little. It was all him that decided to work a little bit in his book several days a week. He worked so hard and learned 109 verses this year! Micah, Mommy and Daddy are so very proud of you! We knew you could do it. Here is our sweet Rebecca with her wonderful teacher, Miss Billie, and Miss Billie's daughter, Miss Shanna. Rebecca LOVES these sweet ladies! Miss Billie has been the ever dependable babysitter for us. She has been there when I went into labor with all of my kiddos. She kept Kyle and Micah for a couple of days while we were in Morgantown waiting to see if Rebecca was going to survive her early birth. Miss Billie also watched my older three kids when we went to the hospital in labor with Ben (over night...again!) Miss Billie was the ever faithful friend calling to check on our dear Ben while he had surgery in Columbus. She is very special to us! We all love her. Rebecca moves up to the next T&T class next year. Thank you Miss Billie for loving us as you do. Thank you Miss Shanna for loving on Rebecca too!! Lastly, we have Ben. Here he is with his Sparks teacher, Miss Mary. There were days when I think Ben thought the sun rose and set because Miss Mary. Ben was so blessed to have Miss Mary! But I would be remiss not to say he felt the same for Miss April and Miss Lyn! What a blessing for a mom to leave her child in their classroom knowing how much he/she was loved. Miss Mary was so good when Ben was sick this past fall. She offered to come over to our house to listen to him so that he could finish his book this year. She never had to because he was determined to get it done! One thing we all learned about Ben is he is more determined the "sicker" (yes I just used that word) he is. He completed his book and was only a few verses shy of completing the review! No wonder this child has stumped his doctors! He is one lovable spitfire! Ben is a child that really needs hugs and kisses from me. I am more than happy to oblige. Okay now, isn't this doll adorable? I ordered this doll for Mariah and it came in the mail this past week. We plan to take this with us to China in her backpack! It is a soft Asian doll with adorable black yarn hair with a ponytail on each side. I know it is a little hard to see but she is a cutie pie! We continued our shopping this week in anticipation of our trip. 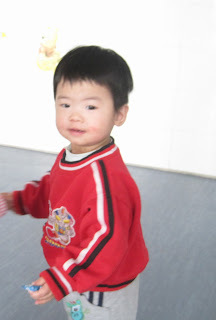 I am so thankful for other adoptive parents who have recently returned from China. They have given us priceless advice. I am hoping not to have too much culture shock upon arrival in China (gasp). These parents have done a terrific job! I went out and bought bug spray.......for those of you that don't know, I have terrible reactions to bug bites. Oftentimes I develop cellulitis as a result of scratching in my sleep. So for Mariah's sake and my own, we are armed with bug spray and Afterbite (anti-itch medicine). We also purchased sunscreen (for Mariah), our Boba baby carrier, a new memory stick for our camera, a new battery for our camera, a new battery for our video camera, diapers, long sleeve jammies (she is used to being bundled), and a couple of more pair of shorts with cute shirts. I honestly don't believe we will ever be done shopping for this trip. To answer your questions.....yes they do sell this stuff in China. We just don't read Mandarin! Since manufacturers are different, we would have no idea what we were purchasing. This week begins our wait for Travel Approval. This is the very last step! Once we received that, we can book travel. Travel Approvals are coming in at around 2-3 weeks. I am still praying for the possibility of travel and return home before June 28th, Becca's 10th birthday! I asked Rebecca if we had to be in China for her birthday, would she prefer her birthday to be celebrated before we leave or after we get back. She said before. When the boys asked why, she told them that she didn't want Mariah to feel left out. So she thought if she celebrated before, then Mariah would never know. What a sweetheart! .....She loves you just the way you are! This Mother's Day is bitter-sweet for me. I have four of my five sweet children here in our home, but one is half-way around the world. The helplessness one feels is sometimes unbearable. I just want her here but I know that the Lord's timing is ALWAYS perfect. It is impossible for me to wrap my mind around the "whys" in this process. I just rest assured in God's promises to me. He is my source of strength. I am very blessed as I sit here today. I was raised by wonderful parents. My mom is a woman that always put her children above any of her own desires. She truly sacrificed for her five children. I even see it now as she sacrifices for her grandchildren. Thank you mom for being a godly example to me. Thank you for showing me compassion. That has ignited the flame that began the journey we are on right now. Having you teach me how to hang clothes out to dry is where we heard that radio broadcast for the first time. That radio program is where the seed was planted and has grown for over 20 years. Thank you for dropping everything to help bring our little girl home to her family and for coming to China with us. I love you mom! Thank you for being such an awesome Grandma to all seventeen of your grandchildren! My Grandma Smith is no longer here. Four years ago this month, my Grandma went home to be with our Lord. She was met there by my sweet Granddad. Grandma had the most awesome fried chicken recipe! I have tried countless times to replicate that recipe (no specific measurements and the spices used were well.....whatever spices we had on hand). I cannot match that recipe. My mom can do it, but I fail. Grandma lived with osteoarthritis. I took her to the orthopedic doctor once when I was still in high school and that doctor told me that Grandma was living with immense pain. But due to her age, she was not eligible for a knee replacement. You could hear Grandma's joints creak as we helped her stand. The disease meant the grinding of bone on bone, very painful. She now is pain-free! I also have three other women still living that have influenced my life. My Grandma Bash is one of the strongest women I know. She faced some of the most difficult circumstances a person can endure. Grandma faced persecution for most of her life as a young person. You see, she is Jewish. Her parents immigrated here from Hungary. She went to college but had to drop out as a result of the persecution she faced. She married outside of her faith, which is against the way of Jewish culture. Her strength may be where I get some of my gumption. Grandma gracefully watched as my Grandpap passed away ten years ago. She is an excellent seamstress and I was honored to have her make the dresses for my bridesmaids......16 years ago. Then I have my dear Mother-In-Law. LaRue has always made me feel like an integral part of the Kaminski family, junior, as my Father-In-Law puts it. She loves me and shows me in many ways. She loves on our kids and they adore her. When they come for visits, she always wants to help. I feel like she is another mom to me. On our visits to Pennsylvania, she tries to make our visits special. She loves to make our favorite meals for us to eat while there. For a child who has difficulties with change and sensory issues, Micah is blessed to have her, as are we all. Thank you for your love and admiration for all of us. I only wish I could have known you my whole life. Although I have known you now for over 21 years! I am blessed. I also cannot forget Jeremy's Grandma, Claire Leard. As you may have guessed, our Mariah Claire is named after this sweet woman. She is the only grandparent on either side of our families without a namesake. We only thought it was time for that honor. We are all blessed to have her. She is yet another grandmother to our children. She is blessed with 7 great-grandchildren now. Grandma has been the "go to" person for our children when they were babies. Grandma would come down to Jeremy's mom and dad's house when we would visit with our babes. Somehow, Grandma was always able to put those crying babies to sleep, and she was proud to do so. I remember when Kyle was just a few months old, Grandma Leard got down on the floor and changed his diaper. That in itself is huge. But Grandma had just had a knee replacement a few weeks before! She now lives alone as Pappy passed away in January. Life is challenging for her now, but we cannot wait to visit again. As you can see, we are family oriented. I am blessed with my family from birth, and my family I gained through marriage. The women have left a legacy and such an impact on my life. They have challenged me to walk a Christian walk. They love the Lord with an intense love. Thank you Mom, Grandma Smith, Grandma Bash, Mom Kaminski, and Grandma Leard. You have made an everlasting impression on generations to come! For those of you who are not familiar with Chinese adoptions, a ladybug is a symbol of good luck. It is generally thought that they bring good luck. Of course we don't believe in good luck, but we love that ladybugs are a symbol of the adoptions from China. So, can you imagine how extra sweet it was when Rebecca made these for me in Sunday School? This was just the package it was in. There is a round ladybug tag tying the bag closed. I thought that was the extent of ladybugs. Then I unwrapped these sweet little treasures! Evidently, Rebecca started working on these last week. They are river rocks that her Sunday School teachers had the girls begin work on last Sunday. Thank you Miss Denise and Miss Debbie! These are uniquely special to me this Mother's Day. You are really wonderful teachers to these girls too! This past Tuesday, our Article 5 was dropped off. This is all part of Mariah's visa application process. It will be picked up on May 22nd and that officially begins our wait for TA (Travel Approval). I was truly happy that my agency friend finally got her LOA! She waited a very long 222 days. It looks like Jeremy and I will be visiting the orphanage without Karen and Corey. Rest assured, we will love on her little girl. After all, she and Mariah have spent the first 16 months of their lives living as sisters and they are only nine days apart in age. If we are allowed, we will love on her when we are there. Karen and Corey will probably travel in July. We will try for pictures, but we understand that is not always easy. I hope to post on here a few more times maybe even this week. We have a lot of stuff we are working on. I would love to share pictures with you all. Lastly, Happy Mother's Day to all the special women I know! Finally.......the highly anticipated update and .pdf! And there you have it! Our first picture of a happy Mariah, or as we learned, PingPing! (Details on that are below!) Not that she is not a happy baby, we just have not seen that in pictures. This was a picture taken of her for the update that we requested. Twelve very long days after our provisional immigration approval, we finally received our .pdf! This basically is an electronic approval of our immigration petition. From here it will be hand delivered to the US Embassy in Guangzhou. Here the visa application is reviewed to ensure that Mariah meets the qualifications for an immigrant visa. Once this is approved (which is a standard 2 week timeline), they will issue us our Article 5. This will officially begin our TA wait (Travel Approval). Right now, TAs are taking right around 14 days. Then we confirm our swearing in appointment at the consulate and get on a plane to China!!!! We are getting close! We are excited beyond belief! This past weekend was spent shopping. The best part.....Jeremy was thrilled to do it! I have to admit that we had a little sticker-shock. We ended up buying Mariah's crib mattress, carseat, crib sheets, stroller, and a few more outfits. Then we had to get new shoes for all four kids. Wow! Both of my older boys have moved into men's shoe sizes! Becca's shoe size is almost the same as mine. At least Ben still has a while to catch anyone. With all of that shopping done, I feel like we still have so much more to do. My recommended shopping list from my agency is slowly being checked off. I still need to find a good baby carrier for us to use in China. Two are recommended but due to my "height challenge", one is really recommended for my use. I will hold off a couple of more weeks then bite that bullet, happily! We received an email late Sunday night. It was one that I was hoping to get but not certain I would ever receive. We ordered an update on Mariah a couple of weeks ago and we were able to get two pictures and a few measurements. We had asked several questions but were not sure we would get those answers. I smiled hugely when I read what words she is saying.....Mama, Baba (Chinese for Dada), and granny! I know four women that the term "granny" will apply in Mariah's life. Jeremy and I each have a grandmother living and of course our mothers. It was such a happy quick email. We also learned that she still takes a bottle for water, and has been well this winter. One of the cutest things we learned was Mariah's nickname. I asked what they call her and the answer to that question is, "The nannies often call her PingPing. " The photos that I posted last week have already been printed up as my brag book. Then we sent those pictures to both sets of grandparents in Pennsylvania to be picked up at their Walmart. I think my mom takes that photo album out and shows just about everyone. Let's just say that the greeter at Walmart helped my mom shop for Mariah, gave my mom her work schedule, and asked for my mom to bring Mariah in to see her once we get home. My mom has also been asked for me to bring Mariah to her bank and a few other places. We already have a full schedule......in Pennsylvania! We have been blessed again as we were completely surprised to find a grant approval in our mailbox on Friday. We received another $1000 toward our adoption expenses. Truly, this is unbelievable! We had bothered so many of our friends to provide these recommendation letters. Here are just a few that helped us......Marty (several times over), Caleb, Heather, Sharon, Susie, Carol, Christina, Precilla, Mandy, Tim, Pat/Kristin, and Marvin/Jeannie. We solicited our close friends and neighbors for these letters and without these letters our journey would be a lot more stressful, not to mention expensive. We also were awarded a matching grant through Lifesong back in January. We applied for an interest-free loan but they did not have the funds for that program. They did, however, offer us the $2500 matching grant. We struggled with considering this offer then decided we should move forward. The grant was not just matched, it was doubled!!! Our total funds raised for that grant so far has been $4930 (on Sunday someone mentioned they were sending in some more to add to the grant) then it was matched by Lifesong up to $2500 for a grant total of $7430! We are blessed with generous family and friends. Thank you all from the bottom of our hearts for making the difference in the life of Mariah. Thanks to you all, she will now know the love of a Mama and Baba and 4 siblings that already adore her. Not to mention the grandparents, great-grandparents, aunts, uncles, and cousins anxious to meet her. I would be remiss not to mention our church family as well. You all mean so much to us as we have seen you cry along with us. Some of you have made us cry! This journey is very real to you all as well and we love you! Thanks to everyone's generosity, we will be able to complete this adoption without incurring any additional debt! As we review our finances, we are so very close! We never would have dreamed to complete this adoption without debt!